Utilities add corrosion inhibitors such as silicates and phosphates to protect their pipes. The EPA requires municipal water authorities to use corrosion inhibitors, based on the composition of their water, to prevent lead, copper, and iron from leaching out of the pipes and flowing downstream to consumers. The anti-corrosive protection used by the utilities does not extend all the way to buildings and homes. 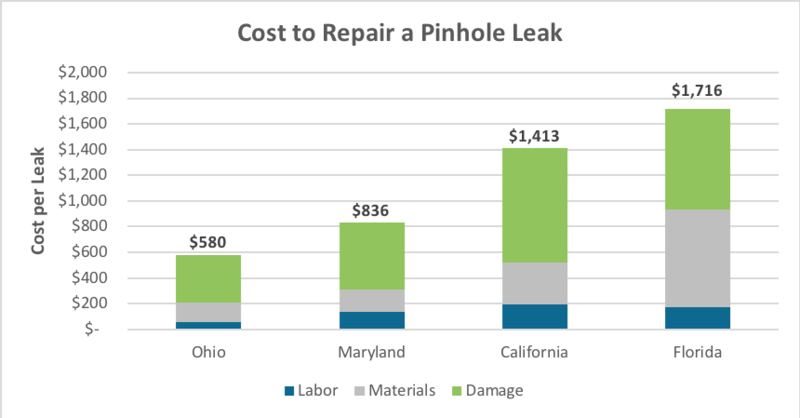 While pinhole leaks are costly and a nuisance to maintenance managers and affected residents, the reality is that their true cost is far greater than it appears on the surface. In addition to the labor and material costs to stop and repair the leak, there are indirect costs that can be exponentially higher. From personal property damage caused by leaks, to brand reputation to the property and resident dis-satisfaction, the impacts of pinhole leaks are often much worse than the leak itself. In fact, if a property has plaster walls, asbestos insulation or mold due to leaks then the cost can be far greater than shown in the graph above.